I’ve heard photography described as the art of capturing light, and perhaps I’ve been guilty of describing it that way as well. Photographic tips often talk about looking for dynamic light, chasing the good light, etc. Yet photography is more than light, it is also time. Consider your camera. Leaving ISO aside, there are two ways to control exposure: changing the aperture and changing the shutter speed. Time is an essential part of photography. Too little time, and your image will be black; too much time, and it will be white. Every photograph captures a slice of time. Sometimes a very small slice, a small fraction of a second; sometimes a long slice of minutes or even hours. The human eye is better at capturing light than a camera. The human eye can see detail through a very large dynamic range compared to the best DSLRs out there. This is why HDR is popular, why there camera accessories like split-neutral density filters. But, at least in my opinion, the camera is better than the human eye at capturing time. My camera can capture the action of a running gazelle much better than my eye can. Similarly, it is much better at capturing the movement of the stars across the night sky. Time makes every photograph unique. Each image captures a different piece of time, and each piece of time is different. I use to tell my kids when they were young, that if they wanted to see something no one in the world had ever seen before, pop open a peanut shell. No one in the world ever saw that particular peanut before (and no one would see it again after they ate it). The same is true for photography, want to capture something no one has every photographed before, take a picture, any picture – you’ve just captured a bit of time that will never be captured again. Okay, I hear you. If you take two photographs one second apart, you have two nearly identical photographs (the extreme example, I guess, being two studio-lit shots of a still life taken seconds apart). I didn’t say your capture would be exciting, only different (and perhaps not even on a visible scale). Making that capture of a small slice of time exciting, making the image worthy to look at, is where the art comes in. The act of capturing time with a camera is not art. Instead making that capture an experience (both for the photographer and the viewer) is the art of photography. Just like composition makes a big difference in photography, selecting the correct small portion of time to record also makes all the difference. Look at the four examples below of the Colorado River taken from Dead Horse Point State Park in Utah, taken minutes apart and all processed the approximately the same way in Lightroom and Photoshop. I took the first two before sunrise, four minutes apart. The third was taken seven minutes later and the fourth seven minutes after that. Depending on your tastes, the second or the third ones are clearly superior than the first or the fourth (my favorite is the second one). A few minutes made all the difference here. Image taken at 6:51 a.m. Image taken at 6:55 a.m. Image taken at 7:02 a.m. Image taken at 7:14 a.m. Selecting the correct time to press the shutter button is not limited to the quality of the light at the time, it also is dependent upon the subject. The best people shots come with when the subjects are showing their emotions to the camera, something that is difficult to capture because it is often so fleeting. And this timing aspect is not limited to people. When shooting scenes with flags flapping in the breeze, for example, I will usually take many shots, just to capture one where the flag looks good. Here’s a couple more examples. The first image, taken on Caye Caulker in Belize, is a little girl fishing with her father. I snapped of a dozen shots, but this is clearly the best, with the girl lightly touching her father. As you might imagine, a girl of this age didn’t hold that pose long, but was quickly looking this way and that, and interacting with a brother just out of the frame. The second shot is of the Palace of Fine Arts in San Francisco, I wanted an image with the swans in the pond, and was lucky enough to capture them in a good , with one looking directly at the camera. The birds were only in this position for a quick moment, and all the other shots I took don’t come close to the quality of this one. Often timing is critical when shooting human subjects, with split seconds being the difference between an image with emotional impact and one without. Here, the girl was only touching her father for a few seconds. Timing also is critical with non-human subjects. These swans were only in this position for a brief moment. The length of time captured in your image also makes a difference and, as I mentioned above, can reveal things not readily apparent to the naked eye. This is true both for short exposures and for long ones. For example, in the following image of snow geese in the Skagit River delta area of Washington State, the very short shutter speed was able to capture some unique looking wing angles and positions. In the second example, of the ferry dock at Steilacoom, Washington, a long shutter speed created beautiful patterns in the water. If you are a regular viewer of my photography, you likely know that I love using long shutter speeds for the effects of it creates – the effect of compressing many seconds of time into a single image. Here a shutter speed of 1/640th of a second freezes the swans wings into interesting shapes and angles, not visible to the naked eye. A 15 second shutter speed was used for this image, creating interesting patterns and reflections in the water not typically visible to the human eye. Sometimes two different sets of time can both be important to an image. In this example, taken from my trip up to Harts Pass several weekends ago, a long exposure was necessary to capture the stars. For images such as this, too short a shutter speed will not show many stars; too long a shutter speed will result in star trails instead of points of light. The shutter speed for this image was 20 seconds. (Generally, for star shots without trails, you will need to shoot at 30 seconds or less). However, in this image, I wanted to add some foreground interest, and I chose to do light painting on the tree. I painted the tree for just a couple of seconds, running the light from the flashlight briefly up and down the tree. More than a few seconds would have made the tree too bright; less, too dark. Here a long shutter speed (20 seconds) was necessary for capturing the stars. In contrast, a short amount of time was needed to properly light paint the tree. Here’s one last example of the importance of time to photography. The image below is of a tree with colorful leaves taken while moving the camera vertically downward. I used a shutter speed of 1/8 second. A longer shutter speeds would have resulted in too much blurring; a shorter shutter speed, too little. The proper shutter speed for this type of shot will vary greatly depending on the subject and the amount of camera movement. Shutter speed is critical when creating pleasing abstracts with camera movement. These are just a few examples of the importance of time to photography. I’m sure you can think of more. Photography is nothing without light, but it is also nothing without time. Last Tuesday, I spent a few hours working on some night photography down on the Ruston Way waterfront with a small group from the Mountaineers. We got quite a few questions about what we were doing down there with cameras and tripods at night. I guess we should have told them we were working on our night moves. But unlike the Bob Seger song, we were working in winter instead of summer. Winter is a great time for night photography because the night comes early, and you can still get home at a decent hour. Of course, it has disadvantages too, like the weather. Though not extremely cold, only about 40° F (about 4° C), it does get chilly standing around waiting on those long exposures. I’m really starting to enjoy doing night photography. The camera picks up lots of color and detail that the eye cannot see. I recently read Night Photography, Finding Your Way in the Dark by Lance Keimig, and I have a long way to go before ever approaching his abilities. But I have fun. I highly recommend Keimig’s book to anyone wanting to learn more about night photography, it has lots of good information. One of the great mysteries of night photography is getting the correct exposure without excessive noise. Digital noise is the bane of many a night photographer. Noise increases with long exposures, high ISOs, and underexposed shots. That’s why, with night photography, you should still use low ISOs and exposure for the right side of the histogram (while not allowing any important highlight to be blown out). Shooting this way, will help minimize noise, but will lead to long (or very long) exposure times, very often over 30 seconds (the longest programmed shutter speed on most cameras). Therefore, to get the correct exposure, you will often be shooting in manual mode with the shutter speed set to bulb. Knowing how long to leave the shutter open is a difficult question. It’s a real pain to wait through a 2-minute exposure only to discover when looking at the results that it should have been a 4- or 8-minute exposure. Here’s one tip I found very useful from Keimig’s book. Set the camera to a very high ISO and take a test shot first. This can be used to check both composition (it’s sometimes hard to compose through the viewfinder in the dark) and exposure. To make the exposure math easy, Keimig presents a chart in his book and on his Nightskye website. Basically, for cameras with a native ISO of 100 (Canon cameras for example), set the ISO to 6,400 and take one or more test shots to find the correct exposure. The number of seconds in the correct exposure at ISO 6,400, is the number of minutes for the correct exposure at ISO 100. For cameras with a native ISO of 200 (like most Nikons), the test shot ISO should be set to 12,800 and the normal shot ISO at 200. (If your camera doesn’t have such high settings, his chart shows how to compensate). For example, I use a Canon camera. So for the featured photo above, I took a test shot at ISO 6,400 and found the correct exposure was 4 seconds. I switched the camera to ISO 100 and re-shot with an exposure of 4 minutes (in both cases, of course, using the same aperture, f/8 in this case). Much easier than guessing on the correct exposure. Thanks to Lance Keimig, I’ve solved one the mysteries of my night moves! “Photographers do it in a darkroom,” or so says an old bumper sticker. But now in the days of digital photography, fewer and fewer photographers use a darkroom. So what do photographers now do in the dark – they do light painting of course! Wait, you say, what is light painting? Light painting is a photographic technique where your make exposures by moving a light source to light select objects, or select portions of the photographic frame (you don’t have to paint an object). It is typically done in the dark. You can use any light source: flashlights, camera flash units, even cell phones – anything that makes light. Last week, at our regular, monthly Mountaineers photography meeting, we walked down from the Tacoma clubhouse to Ruston Way. For those unfamiliar with Tacoma, Ruston Way is along the Commencement Bay waterf ront and is lined with many waterfront parks. This was my first attempt at light painting with a digital camera (I tried it about 15 years ago with slide film and did not like the results). Light painting works great with digital cameras, you can easily see the results of your efforts and make changes as necessary. 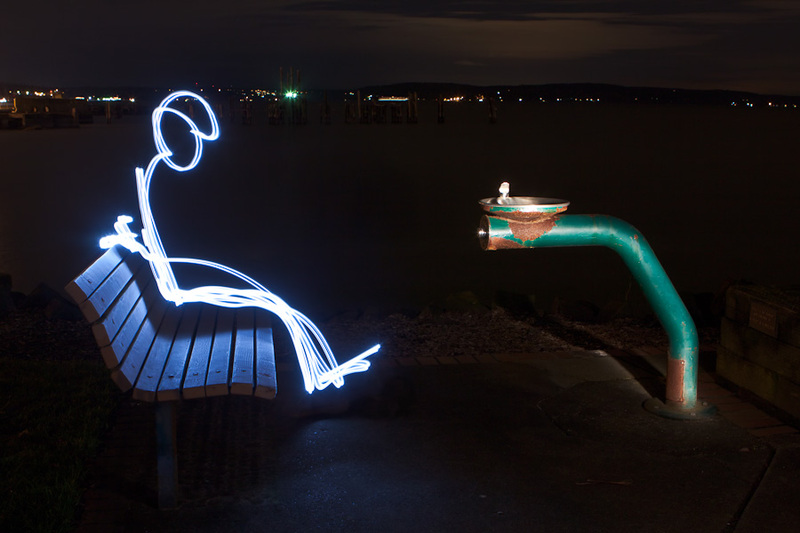 In the featured image above, I used a book light, which had two LED bulbs, to draw the “person” sitting on the park bench then used a regular flashlight to light up the drinking fountain. The exposure lasted for 63 seconds at f/8 and ISO 100. Sometimes it is fun to use a model in light painting. You can move the same person to multiple positions in the same photo. The second image shows my friend Gary Peniston resting on the park bench and drinking from the drinking fountain at the same time! 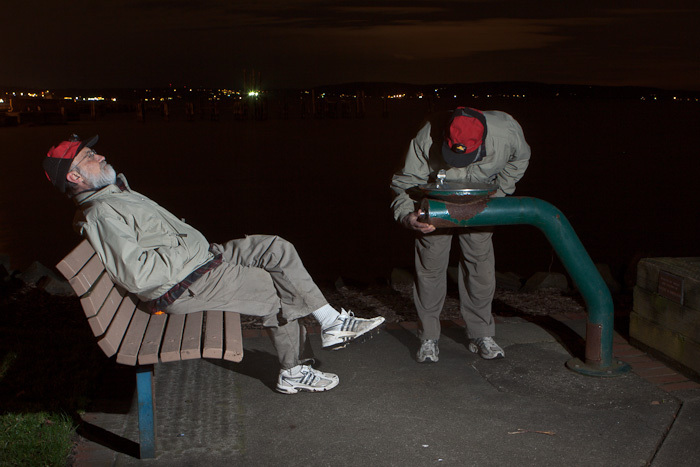 I had Gary first sit on the bench, then lit him with a single flash from an off-camera strobe. Then he moved to the drinking fountain, and I used the flash again. The whole exposure was for 36 seconds at f/8 and ISO 100. The third image is Gary again (Gary earned the honor of being everyone’s model by having the battery run out on his camera and not having a spare with him). In this image, which could appropriately be called “Afraid of his own Shadow,” I first had Gary stand with outstretched arms while I lit him from behind with a small LED flashlight, circling the flashlight around his perimeter. Then I had him move and sit down and act scared, while I lit him with the off-camera flash. The whole exposure was 75 seconds, again at f/8 and ISO 100. 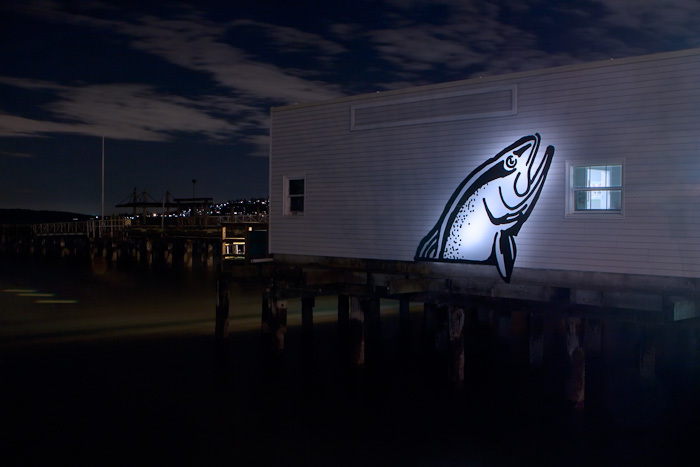 The final three images show more traditional “painting.” In these three, I used a flashlight to light selected objects in the frame – in one case a tree, in other a cement wall and pilings, and in the last one a fish painted on a building wall. In the tree photo, I exposed the image for 77 seconds at f/8; in the cement wall and pilings (with Browns Point in the background)image, I used an exposure of 66 seconds at f/10; and the building with fish image was exposed for 29 seconds at f/10. All used ISO 100. On the fish building photo, the lit window showing the inside of the building was totally blown out by that exposure, so I took a second 5 second exposure and superimposed the window from the second shot onto the first. Of course, a tripod is important for doing these kind of images. Also, digital noise is a problem, which is why I selected ISO 100, which is less noisy than higher ISOs. Plus, using a low ISO allows for longer exposures, which are needed as you move in and out of the picture with your light sources. 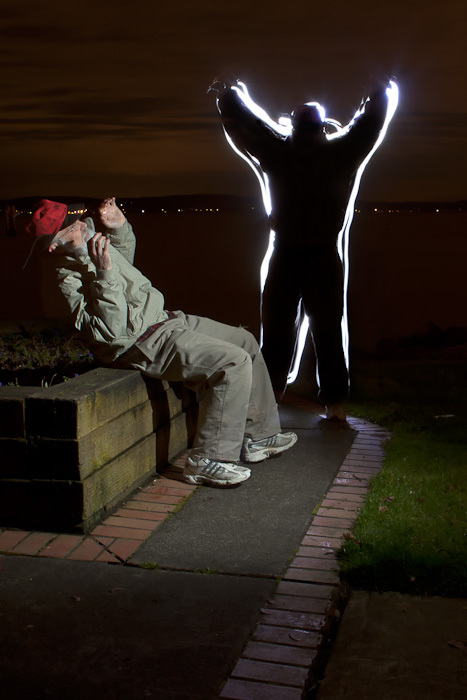 Our little light painting outing was great fun. I’ll definitely be doing this again in the future, not waiting 15 years this time.